New LRS President Dr. John Cooke GM8OTI presented his President's Address "Home-brew /P" on Wednesday, 8th September at the Braid Hills Hotel. 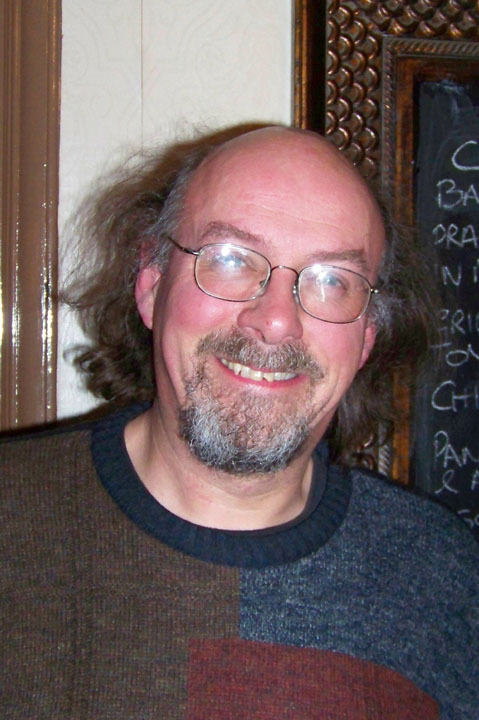 John's main interests in Amateur Radio are VHF and up, simple "home-brew" radio equipment, and portable operation. 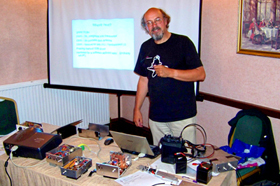 He talked about some of his recent projects, including linear amplifiers, antennas, and a 23cm transverter. He illustrated his talk by bringing along the results of some of these projects. For a more complete report, go to Meeting Reports. 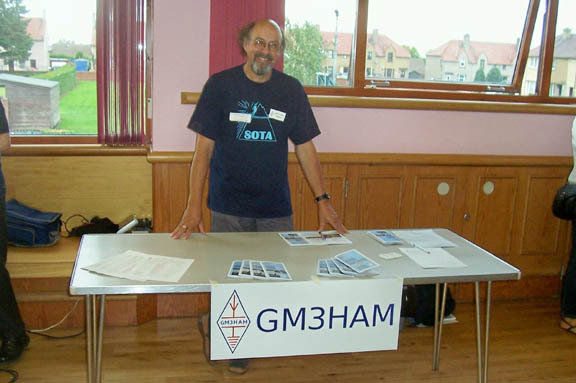 The Lothians Radio Society had a promotional table at this event with the new GM3HAM banner on display and staffed by LRS President John GM8OTI. A number of positive enquiries about LRS membership were received. At least 12 LRS members attended. An album of photographs has been posted under Society Activities. L-R: Stuart MM3TZP (operator) and SWL MIchael (logger) did a great job on 2 metres. VIEW MORE PHOTOS OF THIS EVENT BY GM4DIJ & GM3PSP IN 'SOCIETY ACTIVITIES'. 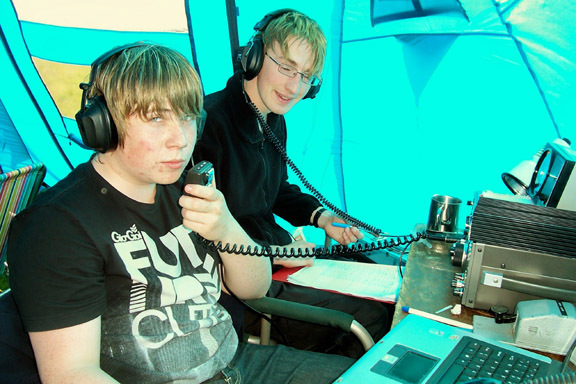 Using the LRS club callsign GM3HAM/P a small but dedicated group of members of the Lothians Radio Society took part in VHF NFD from our usual site in the hills near Gatehouse of Fleet on the Solway Firth in Dumfries and Galloway on July 3-4. Operation was on 6m, 2m and 70cm. The operators were Mike GM4IGS, Alan GM3PSP, Robin GM4YPL, Colin GM4HWO, Pete GM4BYF, Brian GM8BJF, Stuart MM3TZP, Brian GM4DIJ and SWL MIchael. On the Saturday there were excellent Es conditions into Europe on 6m. 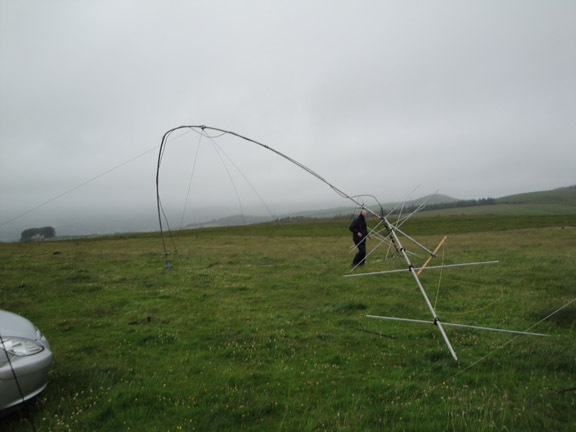 Unfortunately disaster struck at breakfast time on the Sunday morning when a violent squall brought down the 6m beam and the main operations tent, causing our event to be abandoned at that point. It is rumoured that one member had to drive home in his PJs and another was swearing to buy waterproof trousers asap! The members present at the AGM voted to increase the annual subscription to £18 for members and £9 for scholars to help cover the costs of our excellent new venue at the Braid Hills Hotel. It was agreed that efforts should be made to increase membership. These will include publicity using the new LRS brochure, to be distributed at rallies and local organizations, and the use of the LRS website to show photographs of recent meetings and events. Many suggestions were made for meeting topics which will assist the new committee when it meets shortly to plan the program for the new club year starting in September. 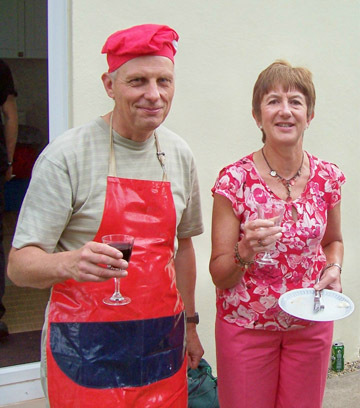 The annual Barbecue of the Lothians Radio Society was held on Wednesday 30th June at the QTH of Pete GM4BYF and Kay Bates GM6KAY and was enjoyed by all who attended. Our thanks go to Pete and Kay for their kind hospitality. For more photographs of this event by GM4DTH and GM3PSP, go to the "Society Activities" area of this website. This was the last meeting of the 2009-10 club year. Meetings will recommence on 8th September when Dr. John Cooke GM8OTI will present his Presidential Address. Our gracious hosts Pete GM4BYF and Kay GM6KAY. We have moved the content of our site to a format that will (we hope) be more attractive, easier to maintain, and more useful and informative. We are now posting photographs of most recent meetings, Field Days etc. See what you may have missed! It is planned to add a section on the Lothians Archives, including photographs. If you have photographs that might be suitable, please contact Alan GM3PSP QTHR. 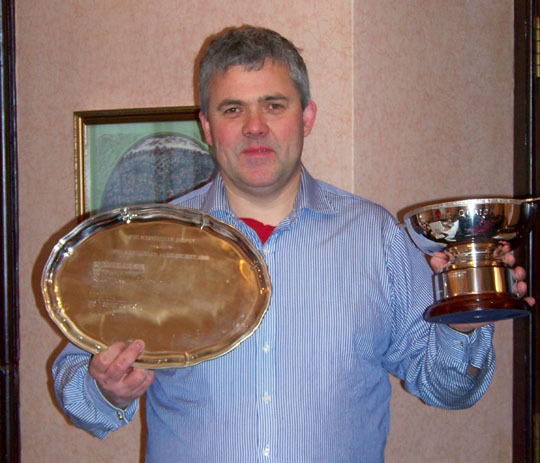 At the LRS meeting on 24 February the President, Colin GM4HWO displayed the contest trophies that had been won in the 2008 VHF National Field Day (5-6 July). The trophies are the Martlesham trophy (left), awarded for first place in the Restricted Section, with an overall score of 3476 points and top band-scores on 70 MHz and 144 MHz. Lothians RS were Runners-up in this section in 2007. The trophy on the right is the Cockenzie Quaich, retained from 2007, awarded to LRS as the highest placed Scottish entry in this section.